A flurry of features for feed readers: "
Since our last big launch, we've been thinking about ways to help our users better share, discover, and consume content in Reader. Today, I'm happy to announce several new features that we hope will further improve the way you use Reader. Just head over to the settings page, and enable the services you want to use. If your favorite service isn't listed (and you're feeling extra geeky), you can create your own 'Send to' link with a URL template. To share an item on one of your sites, simply click the 'Send to' button and choose your service. If you're into keyboard shortcuts, 'shift-t' will do the same. 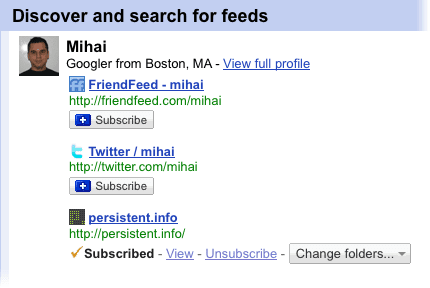 When we added following, we tried to make it easier to find and follow people who share similar interests. Now we've gone even further, and made it possible for you to subscribe directly to the blogs, photos, or Twitter updates that anyone you're following has included on their Google profile. To quickly subscribe to these sites, click the 'From people you follow' tab on the 'Browse for stuff' page. We know people can be overwhelmed by too many unread items, and sometimes only want to see recent posts. The 'Mark all as read' button now has a menu that lets you choose to only mark items as read if they're older than your specified time frame. A tip of the hat to Nick Bradbury who pioneered this 'panic button' feature. When you expand an item in comment view, you now get the full set of actions, enabling you to share, like, and star items without leaving comment view. We added a 'Feeds' start-page option for the iPhone/Android/Pre mobile interface, so you can see a list of your subscriptions when you sign in. There is now an option to show notes when embedding your shared items on other pages as clips. As always, if you have feedback, please head over to our help group, Twitter, or Get Satisfaction.